Nearly any horse can make a good driving horse under the right circumstances. It cannot be emphasized enough, however, that if you are not an experienced driver, you must solicit the help and supervision of an experienced harness trainer before beginning your horse’s training. 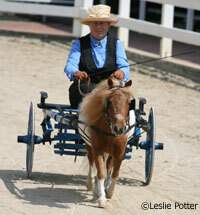 The Carriage Association of America maintains listings of driving trainers and instructors on its website here. Horses can be started in the lines as young as two years old. 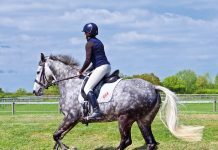 At this age, horses are too young to bear the weight of a rider as their joints are still developing and can be damaged by heavy weight or work. Pulling a cart on a flat area is considerably less physically stressful than carrying a rider. 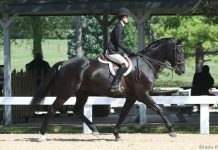 However, overworking a two-year-old in any capacity, including driving, can lead to soundness problems later in life, so avoid hills or long workouts for the younger horse. In her book, Breaking a Horse to Harness, British Driving Society instructor and carriage driving judge Sallie Walrond suggests breaking a horse to cart and harness as a two-year-old, then allowing him to grow up for another year before beginning serious training as a three-year-old. 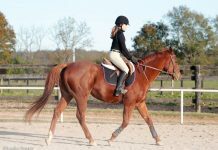 Though the actual harness training should be done with hands-on help from a professional, there are several elements you can work on with your horse to ensure he has a solid foundation before you attempt to hitch him to a cart for the first time. The horse should be accustomed to wearing and responding to a bit. The horse should be used to wearing a surcingle. Horses that have been trained to ride will take to this easily as they are used to wearing a girth. The horse should respond to voice commands for stopping and going. Keep in mind that you will not have the benefit of leg or seat aids once you are sitting in the cart, so you will be dependent upon your reins, voice and whip. The horse should be comfortable wearing a crupper under his tail. If you will be driving a carriage, your horse will need to accept breeching around his hindquarters as well. The horse must tolerate the feeling and sound of dragging something behind him. Once you’ve reached this phase of harness training, it is imperative to have knowledgeable supervision. Working your horse in the long lines (or ground driving) is ideal preparation for driving. The horse will get used to wearing the harness and responding to rein aids before he ever sees a cart. I trained and drive my mini and it’s very rewarding. Highly recommended.